Hope everyone has had a wonderful week and weekend! A huge thank you to everyone that entered my recent giveaway for some Marilyn Leavitt-Imblum charts! 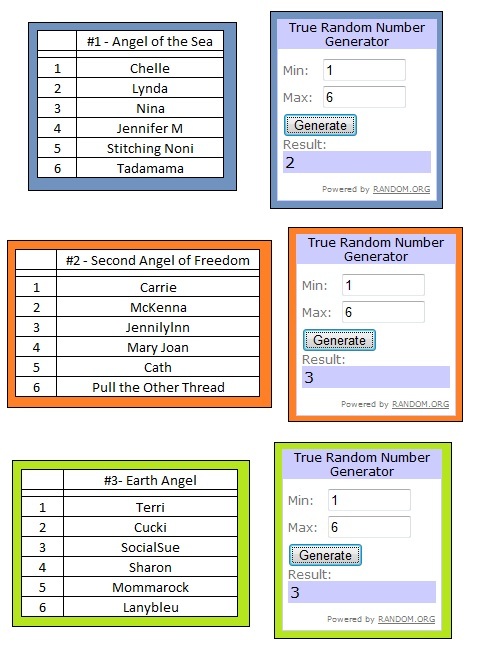 Here is a breakdown of the names entered for each chart and the winner chosen for each one (by Random Number Generator). Oddly enough, the number 3 came up twice in a row.....I suppose the odds of that happening were pretty high as the total number for it to generate from was low. Congratulations to the Lynda, Jennilynn and Socialsue!!! I'll be sending you an email shortly to get your mailing address. Bummed I didn't win, but congrats to those who did. I doubt I will ever finish the charts I have by her, so it's probably a good thing I didn't win!